Dr. Ehud Ganani is a research fellow at the International Institute for Counter-Terrorism (ICT). 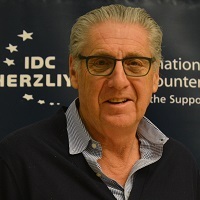 As Vice President, Israeli Operations for EIS Council, is responsible for development, coordination and management of the Council’s activities in Israel. Udi Ganani is a co-founder of Contguard Ltd., a global maritime container tracking startup. He is also a member of the SPECTRUM Group in Alexandria, VA. Previously, from 2005 to 2012, Dr. Ganani served in senior management roles in a number of corporations providing high technology solutions for security applications. He was Chief Executive Officer and President of Rabintex Industries Ltd. (TASE:RBNT), and also served as CEO and then chairman of TraceGuard Technologies Inc. (OTCBB:TCGD), providing explosive detection equipment for airports and other security facilities. Dr. Ganani was chairman of Bird Aerosystems Ltd., and also chaired the public advisory committee for Aerospace, Defense and Homeland Security for the Israeli Export Institute. Earlier in this period, he served as a member of the board of directors for Gilat Satellite Networks (NASDAQ:GILT). Before this, Dr. Ganani served as a senior manager in some of Israel’s largest and most important aerospace companies. From 2002-2005, he was the Chief Executive Officer of Israel Military Industries. Prior to that, he served in various senior management positions in Rafael, the last of which was Vice President of Marketing and Business Development for the corporation, following an assignment as Vice President of Marketing for Rafael USA Inc. Earlier, from 1986 to 2001 Dr. Ganani headed Rafael’s rocket motors development group. Dr. Ganani holds a Doctorate of Science in Chemical Engineering from Washington University, St. Louis, MO and a Bachelor of Science in Chemical Engineering from the Technion - Israel Institute of Technology in Haifa, Israel.